Fifth-generation owner Jake Dell explains in great detail what makes their pastrami so special. One key: it's carved by hand; never by machine. 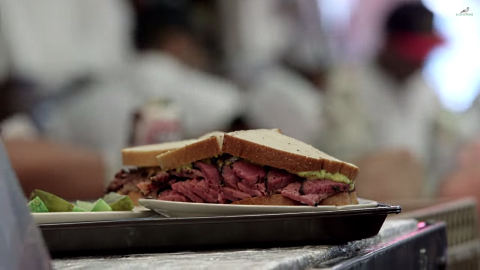 That Katz’s Deli is an iconic NYC institution is unquestionable. Sandwich connoisseurs come from all over the world to visit it for that very reason. The Katz’s staff takes extreme care with what they do. The deli has been perfecting this process over the last 126 years, so they should be pretty good at it by now. Fifth-generation owner Jake Dell sat down with WNYC and shot the video above, talking in great detail about the process of making their pastrami. Of note: Katz’s goes through a staggering 15,000 pounds of pastrami every week—and sometimes even more. They also serve around 4,000 people every single day. We definitely didn’t expect Dell to give away everything, but the information he provided definitely gives some insight into what makes good pastrami. Pastrami (and all Katz’s other meats) are cured in their 20′ x 30′ walk-in refrigerator, for about 3 to 4 weeks. Katz’s uses a “wet-cure, simple salt solution” for their pastrami, along with additional secret ingredients. Finally, the pastrami is carved by hand. By the time it undergoes all the processes that make it delicious, Dell says it would “literally crumble” if you tried to slice it on a commercial slicer. He describe the cutters as artists, and if you look at the clean, precise slicing action in the gif above, it’s clear that they are. Dell offered some final words of wisdom on why he thinks Katz’s is so iconic.